Tanzania Queens beat Harambee Starlets 2-1 to in a fiercely contested final match of the Cecafa Women Championship in Jinja, Uganda. In the play-off for third place, which was also played on Tuesday, Ethiopia thrashed Uganda 4-1. Coach David Ouma made three changes to his squad, restoring custodian Vivian Akinyi and Christine Nafula who did not feature in Harambee Starlets 3-2 win in the semi-final match against Zanzibar on Sunday. Kenya started on a high forcing Tanzania to concede a corner kick in the fifth minute and was taken by Esse Akida but the ball went out for a goal kick. Tanzania replied immediately with team captain Asha Rashid coming in with a hard shot that went wide for a goal kick. Tanzania’s Mwanahamisi Omari and Stumai Abdalla scored for in the 27th and 44th minute while Christine Nafula slotted home a consolation goal in the 50th minute. Coach Ouma was forced to make changes six minutes later with Nafula paving way for her elder sister Doreen Nabwire, who lasted only few minutes as she was injured and her place taken by Cheris Avilia. Elizabeth Ambogo came in for Corazone Aquino. 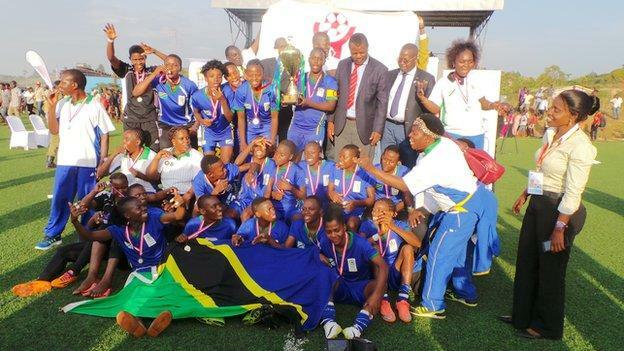 Despite mounting sustained pressure, Tanzania held of the challenge to see out the fiery clash and in the process bag the inaugural Cecafa Women Championship title.